The property sheet enables you to view and edit properties and events for your forms and controls. At the top of the property sheet is an alphabetical list of the controls in your form. You can display the properties of a control by selecting its name from the list. If you select a group of controls, the list contains the individual controls in that group. You can easily change the properties of one of these controls by selecting it from the list. The Properties tab in the property sheet contains an alphabetical list of properties for the currently selected control. 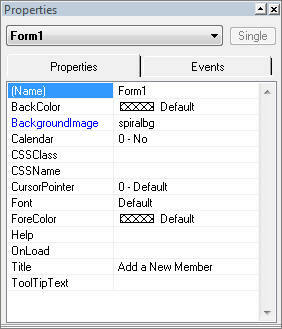 If no control is selected, then the property sheet contains the properties for the current form. The properties determine what your forms and controls look like and how they behave at run time. Some properties can be bound to data. These properties show up in blue in the property sheet. You can also set many properties dynamically, meaning you can insert code in your procedures to change the values of these properties at run time. For example, you might want to display some text to end users after they click a button. To do this, place the text on the form and set its Visible property to No. When end users click the button, you would dynamically change the Visible property for the text to Yes, thus displaying the text. You can type the syntax into the procedure to change these properties, or you can drag the property into the procedure, and WebFOCUS Maintain generates the correct syntax for you. For more information on this syntax, see How to Set the Value of a Form Property, How to Set the Value of a Control Property, and How to Set the Value of a Control Color Property. Note: You cannot drag properties that cannot be set at run time. An example of the property sheet is displayed in the following image. For a description of each property, see Form and Control Properties Reference. The Events tab in the property sheet contains a list of events for the selected control or form. Events are changes in the state of a form or control that generates an action, called an event handler. You can see which events have event handlers in the Events tab. You can also open the Event Handler editor by double-clicking an event. An example of the Events tab is displayed in the following image. For more information on events, see Defining Events and Event Handlers. On the form, select the control whose property you want to change. If you want to select the form, click anywhere in the form outside of a control or, in the property sheet, select the control from the list of controls at the top. Find the property you want to change (you may need to scroll down in the list to find the one you want). For some properties, you can enter the value directly in the box to the right of the property name (for example, the (Name) property), as shown in the following image. For some properties, you must select the value from a drop-down list, shown in the following image. Click the List button to the right of the property to see a list of values and select one. For some properties, you must open a dialog box to determine the value for the property. Double-click the property or select the property and click the ellipsis button in the box to the right of the property. To set a property in the Events window, open the Events window. To set a property in a procedure, open the procedure in the Procedure Editor. Make sure that you can see the window and the property sheet. Select the control whose property you want to set dynamically. If you want to select the form, click anywhere in the form outside of a control or, in the property sheet, select the control from the list of controls at the top. Select the property you want to set dynamically by clicking it. You may need to scroll down in the list to find the one you want. You cannot dynamically set bindable properties, which are the properties in blue. Click the property again and drag it to the window where you want to insert this statement. If you cannot drag the property, which means that you cannot set it dynamically. By default, the syntax generated is the current value of this property. If you wish, change the value for the property setting. Form and Control Properties Reference contains a complete list of settings for each property.